deepsouthsports.net: Seriously?! The guy on the left is an SEC head coach? Seriously?! The guy on the left is an SEC head coach? 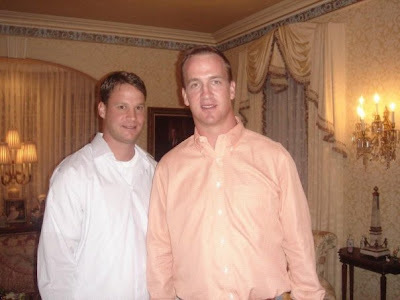 Peyton poses with a star camper at the recent "Manning Passing Academy"
WTF? And Yankee NFL fans make fun of Elisha for looking like a douchey little brother? "Um...Love what Layla's done with the place, Lane." Did they go shirt shopping at the Campus Book Store? Seriously?! Erik, you still operate this blog?! Easy, Tiger. This too shall pass. Well I should hope so. We've got CWS action currently, which also means football season is almost here.